The Dumbbell Nebula, also known as Messier 27 (M27), is a bright, large planetary planetary nebula located in Vulpecula constellation. The nebula lies at a distance of 1,360 light years from Earth. It is sometimes also called the Apple Core Nebula or Diablo Nebula, and has the designation NGC 6853 in the New General Catalogue. The Dumbbell Nebula was the first planetary nebula to be discovered. Charles Messier included it as M27 in his catalogue of deep sky objects in 1764. Planetary nebulae are the remains of stars similar to our Sun. When they reach the end of their life cycle as evolved red giants, they expel their outer gaseous layers to form the nebula, which is then heated by the hot core of the central white dwarf. This will be the fate of our Sun in roughly five billion years. Like other planetary nebulae, the Dumbbell Nebula is formed by a central star that illuminates its expanding shell of gas, expelled by the star after it had used up all of its nuclear fuel. The central white dwarf in M27 is really just the core left from the original star, and it is extremely hot. 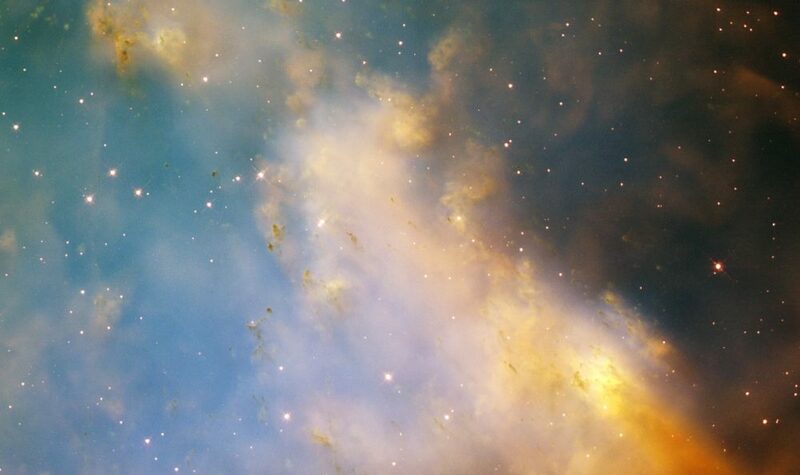 Planetary nebulae were named for their resemblance to the gas giants in the solar system in telescopes. They appear as small diffuse objects, not unlike the outer planets, when observed in a telescope. The Dumbbell Nebula has an apparent diameter of about 8 arcminutes. It has a visual magnitude of 7.5 and an absolute magnitude of -0.5, which means that the nebula has an intrinsic luminosity roughly 100 times that of the Sun. 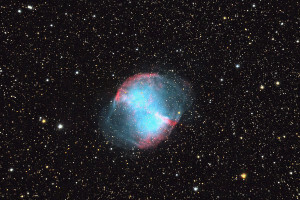 M27 can easily be seen in binoculars and small telescopes, and is a popular target among amateur astronomers. When observed from Earth, Messier 27 appears along its equatorial plane, much like the Little Dumbbell Nebula (M76) in Perseus constellation, named for its resemblance to M27. It we could see the Dumbbell Nebula from the side, it would likely appear similar to the Ring Nebula, Messier 57, in Lyra constellation. The gas ejected by the central white dwarf in M27 is blocked from expanding sideways by a circumstellar disk. As a result, the gas forms two bubbles, one above and one below the disk’s plane. The Dumbbell Nebula was named for its resemblance to a dumbbell when observed in visible light. It has the shape of a prolate spheroid. The name goes back to the English astronomer John Herschel who described M27 as a “nebula shaped like a dumb-bell, with the elliptic outline completed by a feeble nebulous light” in 1833. 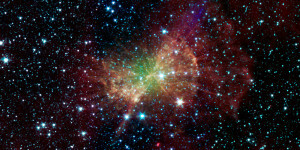 Charles Messier discovered the nebula on July 12, 1764, and included it as the 27th object in his catalogue. He didn’t know at the time that M27 was the first planetary nebula to be included in his catalogue. He described it as an oval nebula without stars. The Dumbbell Nebula is one of only four planetary nebulae entered into Messier’s catalogue. The other three are Messier 57 (Ring Nebula) in Lyra, Messier 76 (Little Dumbbell Nebula) in Perseus, and Messier 97 (Owl Nebula) in Ursa Major. William Herschel was the first to designate M27 as a planetary nebula, around 1784. 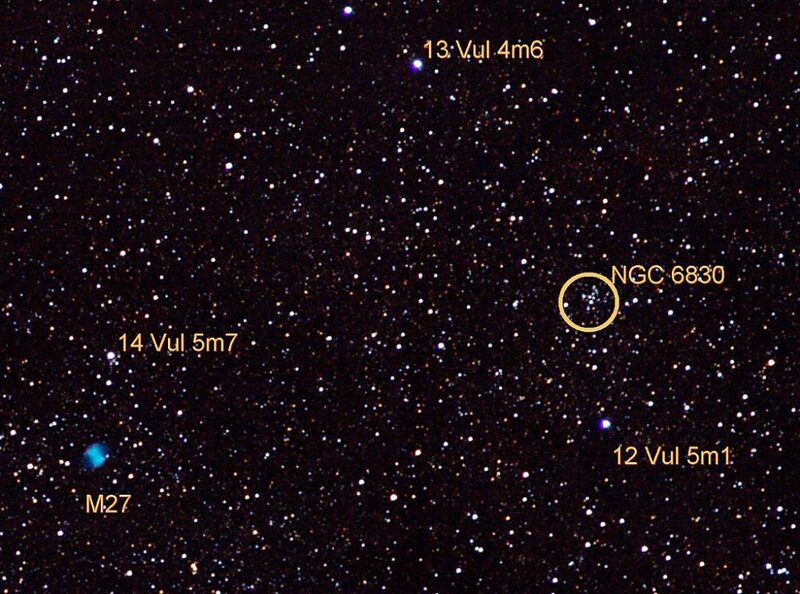 The nebula’s appearance in a telescope was similar to that of the newly-discovered Uranus. Messier 27 is a pretty young nebula, with an estimated age of up to 15,000 years. 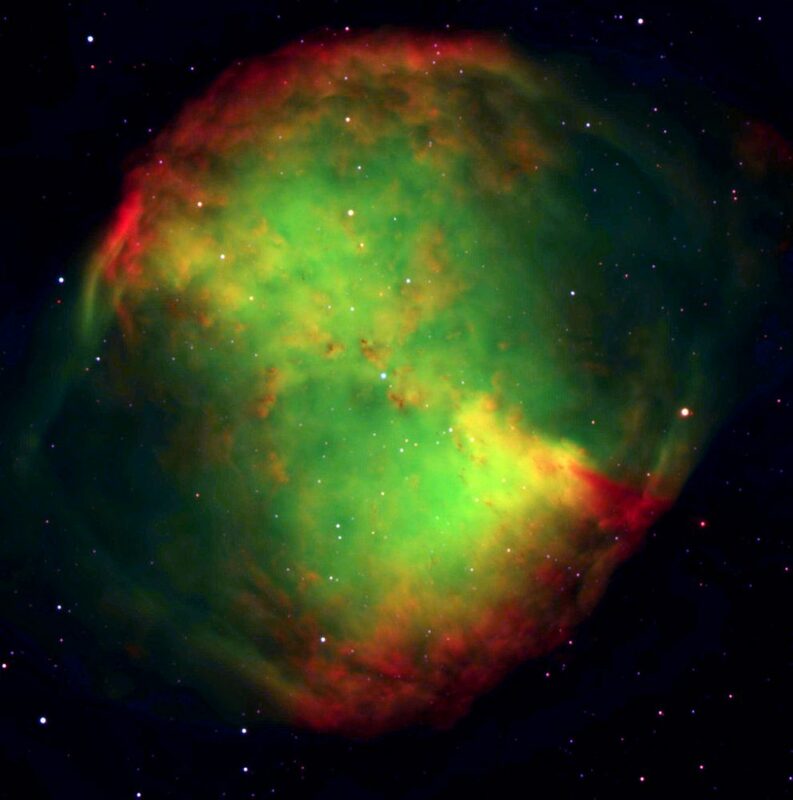 The estimated age of M27, calculated based on the nebula’s expansion rate of up to 2.3” per century, is 14,600 years or younger. Stretching across 15 arcminutes at its faintest extensions, the Dumbbell Nebula is the second largest planetary nebula known, smaller in size only than the famous Helix Nebula (NGC 7293), located in Aquarius constellation. However, the Helix has a significantly lower surface brightness as a result of being larger. The Dumbbell Nebula is one of the finest and brightest objects of its kind in the night sky. The nebula’s main luminous body has an angular diameter of almost 6 arcminutes and its halo stretches out to more than 15′, which is half the size of the full Moon. The only planetary nebula brighter than M27 is the Helix Nebula, with an apparent magnitude of 7.3. The central white dwarf in the Dumbbell Nebula has a visual magnitude of 13.8 and an absolute magnitude of about 6, a third of the Sun’s. The star has a surface temperature of about 85,000 K. It may have a faint, magnitude 17 yellow companion. If it exists, the companion has an absolute magnitude of about 9-9.5, which means that it is about 100 times fainter than the Sun. M27 contains a pattern of dark and bright knots in its central region like many other nearby nebulae, including the Helix Nebula and the Eskimo Nebula in Gemini. The knots vary in size and appearance. The nebula’s central star has the largest known radius for a white dwarf. The radius is estimated to be around 0.055 ± 0.02 solar radii. The estimated mass of the star, as calculated by Napiwotzki in 1999, is 0.56 ± 0.01 solar masses. The Dumbbell Nebula’s shell of gas is expanding at a rate of 17 miles or 31 kilometres per second. The white dwarf will continue to heat it up for billions of years, until it depletes its energy supply and becomes a black dwarf. Other measurements indicate that the nebula’s bright portion is expanding at a rate of 6.8 arcseconds per century, which would put the nebula’s age between 3,000 and 4,000 years. A variable star, known as the Goldilocks Variable, was discovered in the outer regions of the Dumbbell Nebula. It was first spotted by Leos Ondra, who compared different images of M27 and found that the star appeared in some of them, but not in others. 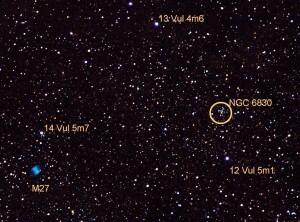 An open cluster, designated NGC 6830 in the New General Catalogue, can be found about 2 degrees to the west of Messier 27. The cluster is approximately 5,500 light years distant from Earth and contains 20-30 stars. Messier 27 can easily be seen in 10×50 binoculars. It appears as a small patch of light. The nebula appears much brighter and larger in 15×70 binoculars, and its central region can easily be made out from the dimmer outer regions. The Dumbbell Nebula’s recognizable hourglass shape can be seen in 80 mm (3.1-inch) telescopes, and the surface details are visible in larger telescopes. The nebula is particularly good to look at through a 200 mm (8-inch telescope).